This brooding classic by Arthur Miller, considered one of the outstanding plays of the century, is the latest production from the Touring Consortium. It is tough going and demands great concentration, and the programme cover of a hangman's noose illustrates the threatening mood. Not a night for escapism then, rather a night to revel in the acting of a large cast. Laurie Dennett's sets are simple and of stark solid wood with the towering threat of waiting gibbets. The Puritan costumes are apt and equally austere, and all the company on stage - no star billing - contribute to the performance. In such a team presentation, directed by Kenny Ireland at the Churchill, it is almost unfair to select individuals, but from the moment Gareth Thomas strides on as deputy-governor Danforth to stamp out devil worship and judge likely heretics he is totally in command. Sean Murray, as poor farmer and family man John Proctor, is hardly off stage and makes the most of the dramatic scene in court when he confesses to an affair with Abigail (Anna Livia Ryan) to protect his wife from her lies. Georgine Anderson is a compelling and dignified nurse, who who chooses to go to the gallows rather than confess to the false accusation of devil worship. 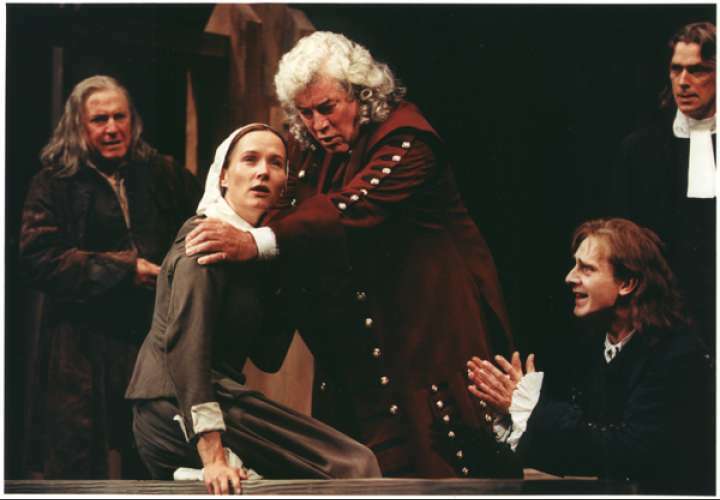 Suzanne Packer has some excellent moments as a helpless West Indian slave who is an obvious and blameless target for the crime of black magic, and Bryan Robson, as blunt and guileless Giles Corey, who is unwittingly responsible for the case against his wife, carries an exact impression of an innocent man, outspoken and doomed. Last updated on 12th of April 1999.